London, UK – February 5, 2018: GE (NYSE: GE) and Arenko Group (Arenko) are delighted to announce a strategic alliance to build grid scale energy storage systems in the UK. The companies will seek to leverage the advantages of combining GE’s battery technology solution, power electronics and advanced controls with Arenko’s leadership in operating batteries in the UK market and proprietary energy trading software platform. Arenko has invested in a 41MW battery energy storage system supplied by GE, who is providing a fully integrated battery storage solution. The project is one of the largest in the UK and globally with the ability to provide affordable, on-demand power to the equivalent of approximately 100,000 UK homes. This battery storage system is sited at a key strategic location in the Midlands and will commence operations in 2018. Once operational it will integrate GE and Arenko’s advanced control technologies and will be commercially operated though Arenko’s software to digitally deploy energy and access multiple services and system needs. The battery system’s reliability and performance will be underpinned and protected by GE’s long-term support. The project will relieve pressure on the UK energy system and provide flexibility at times when it is most needed to deliver a more balanced, secure energy system and contribute to reducing the cost of energy to the UK consumer. The focus is on building long term commercial sustainable battery storage systems, which are not reliant on subsidies and incentives. Changing consumer demands, increasing adoption of renewable energy and security of supply are driving the need for innovative energy networks to deliver a more efficient power system. As traditional centralised generation comes under increasing pressure, energy storage projects such as those announced by Arenko and GE today, will be crucial to maximise generation capacity, ensure efficient energy utilisation and improve the operational efficiency of the grid. Mirko Molinari, Global Commercial & Marketing Executive, Energy Storage at GE Power commented: “Energy storage will help balance supply and demand close to real time, avoiding frequency drifts and supporting the mid-term response to grid imbalances. The flexibility it offers smooths the fluctuating nature of renewable energy, provides quick reserves when needed, stores excess energy generation and much more. Energy storage will enable a more efficient system for a more reliable supply of electricity to consumers. Rupert Newland, Chief Executive, Arenko Group commented: “Arenko’s new battery system will provide much needed flexibility to the UK grid, reducing waste and helping to make energy bills cheaper for households and businesses. This project is very significant in addressing the UK’s long-term energy security concerns, enabling the transition to a low carbon energy future. “As a leading owner and operator of grid scale battery systems in the UK, we are delighted to have established this strategic alliance with GE to deliver large scale battery energy storage projects. We share the same focus and commitment to the sector and we have been very impressed by GE’s world class technology and project delivery of energy storage systems across the globe. GE has invested in Grid Scale Battery Storage technology since 2010. 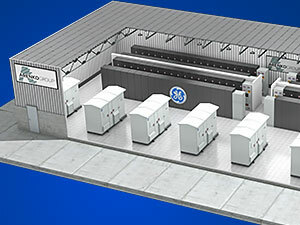 Arenko was established in 2014 to provide large scale energy storage solutions and selected GE, who has a strong reputation of reliability from a repeatable and well referenced design. This first project with Arenko will be GE’s 19th and largest grid scale commercial Battery Energy Storage Solution worldwide.